This year at electronica, Rohde & Schwarz will present its innovations under the slogan Accelerate design. Maximize performance. electronica 2018 will take place from November 13 to 16, 2018 in Munich, Germany. This event takes place every two years and is the world's largest event for the electronics industry. 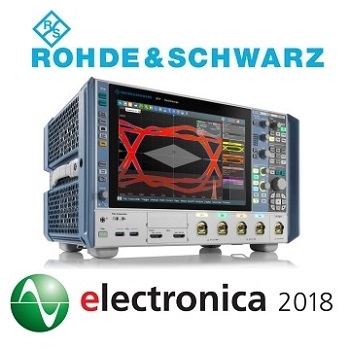 At their booth, Rohde & Schwarz will be exhibiting products such as its highly innovative family of high-performance oscilloscopes, the first signaling test solution for Bluetooth LE and signal generators that set new standards in their class as well as several updated instrument families. They will present a signaling test solution for Bluetooth LE (BLE). For many manufacturers of Bluetooth Low Energy components, testing modules and sensors according to the standard is challenging. These devices often lack any way to connect the control line that is necessary to test them in the prescribed direct test mode (DTM). The BLE signaling test solution for the R&S CMW platform uniquely allows easy testing of the RF characteristics of a Bluetooth LE DUT in a Bluetooth link, either over the air or directly via the antenna without a test mode. The R&S CMW test platform offers three RF test modes: the new BLE signaling functionality, BLE direct test mode, and BLE advertiser mode. They will also demonstrate the R&S CMW270 wireless connectivity tester, which can do more than test RF functions for Bluetooth. Thanks to its measurement bandwidth of 160 MHz, it also supports WLAN RF signaling tests in line with IEEE 802.11a/b/g/n/ac and IEEE 802.11ax, as well as non-signaling RF tests in line with IEEE 802.15.4 for ZigBee, Thread and 6LoWPAN. The new R&S FSW signal/spectrum analyzer will also be on display at their booth. Rohde & Schwarz has improved the performance and ease of use of the popular high-end signal and spectrum analyzer. The new R&S FSW not only features an updated exterior with a new user interface concept and an SCPI recorder for simple programming of remotely controlled test sequences. All R&S FSW models with a maximum input frequency of 26.5 GHz or more are available with 2 GHz internal analysis bandwidth. And 800 MHz bandwidth is available for real-time analysis. With its high sensitivity at input frequencies up to 90 GHz (R&S FSW-B90G option), the R&S FSW85 is unique and ideal for analyzing radar signals and for automobile and A&D applications. The successful R&S Spectrum Rider FPH family from Rohde & Schwarz has also been enhanced and will be on display at electronica. New base units with frequencies up to 6 GHz, 13.6 GHz or 26.5 GHz as well as frequency extensions are available, enabling spectrum analysis up to 31 GHz in the lab and in the field. R&S Spectrum Rider FPH was the first handheld spectrum analyzer on the market with a capacitive touchscreen and a unique keycode concept for frequency extensions. That makes the robust R&S Spectrum Rider FPH perfect for tasks such as verification of 5G, broadcast, radar and satellite transmissions. The company will also present the R&S SMB100B analog signal generator and the R&S SMBV100B vector signal generator. Both of these new midrange devices offer great versatility and high performance in an extremely small package. They feature the highest spectral purity and highest output power in their class, as well as easy and intuitive touchscreen operation. Both generators allow developers in the semiconductor field, telecommunications or A&D to generate signals at frequencies up to 6 GHz. Another highlight will be the R&S RTP high-performance oscilloscope family that combines outstanding signal integrity with high measurement speed and rich functionality. The oscilloscopes capture up to 1 million waveforms per second, compensate for transmission losses between the signal source and the oscilloscope in real time through deembedding, and are extremely quiet even under full load. All these characteristics make the R&S RTP oscilloscopes ideal for debugging electronic modules as well as LSI components with fast digital interfaces or wideband RF interfaces. They are available in three bandwidths: 4 GHz, 6 GHz and 8 GHz. At electronica, Rohde & Schwarz will demonstrate measurements on components with USB 3.0 and PCI Express 2.0 interfaces. Rohde & Schwarz will also demonstrate its innovative test solutions for automotive radar sensors that cover all phases from development to production. The new R&S AREG100A automotive radar echo generator not only allows OEMs and tier 1 suppliers to achieve reliable end-of-line production testing, it also makes it easy and straightforward to perform the mandatory tests for automotive radar sensors defined in the Radio Equipment Directive (RED). The new R&S AREG100 automotive radar echo generator, together with the R&S SMBV100B vector signal generator or the R&S SMB100B analog signal generator, delivers the ideal solution for testing the robustness of radar sensors to interfering signals.